McAfee VirusScan Enterprise for Linux delivers always-on, real-time anti-malware protection for Linux environments. Its unique, Linux-based on-access scanner constantly monitors the system for potential attacks. Regular automatic updates from McAfee Labs protect your enterprise from the latest threats without requiring a system reboot. Award-winning performance — Named a VB100 award winner for 100% detection of “in the wild” test samples, plus zero false positives in a selection of clean files. Always-on protection — Uses heuristic scanning, archive scanning, and cross-platform protection to ensure comprehensive security. Centralized management and reporting — With the McAfee ePolicy Orchestrator (ePO) platform, you can efficiently deploy and manage your Linux, Microsoft Windows, and Mac clients on your network, giving you better security visibility across your entire infrastructure. Control policy configuration, deployment, and reporting for all your endpoints from ePO’s single, web-based console. McAfee VirusScan Enterprise for Linux software delivers always-on, real-time antivirus protection for Linux environments. Advanced, award-winning McAfee antivirus technology enables heuristic scanning, which identifies new viruses and spyware before a patch is available, and archive scanning, which detects viruses hidden inside archived files. McAfee VirusScan Enterprise for Linux software protects Windows systems by blocking viruses that target Windows from passing through the Linux environment. McAfee VirusScan Enterprise for Linux software uses McAfee ePO software for managing security policies and creating detailed coverage and infection reports. Updates are automatic and do not require a server restart, ensuring hassle-free, up-to-date protection. Heuristic scanning — Uses behavior-based rules to identify and block new variants and unknown threats, without the need to download a patch. Archive scanning — Detects and blocks viruses hidden within archived files. Cross-platform protection — Blocks Microsoft Windows malware so it’s not transmitted through the Linux environment. Count on automatic updating from McAfee Labs to ensure the most current protections are always in place — without requiring a server restart. Manage McAfee VirusScan Enterprise for Linux from a single, centralized console with the ePO platform, the first and only scalable tool for managing and enforcing anti-virus protection and policies. Get on-access scanning protection without kernel hooks, saving time and effort when you roll out new Linux distributions. Despite the popularity of Linux-based products, mixed operating system environments remain a necessary choice for most companies. Though this has distinct advantages, it poses security risks to your infrastructure. Unprotected Linux systems may act as carriers, allowing viruses and malware intended to disrupt non-Linux operating systems to move throughout the network. Even after an initial outbreak has been contained, malware may still be able to execute its payload and infect the entire network. McAfee VirusScan Enterprise for Linux software is always on the lookout for new malware and makes regular updates to protect your Linux systems against the latest threats. In addition, on-access scanning without kernel modules saves time and effort when your IT team rolls out new Linux distributions. Heuristic scanning—Behavior-based rules identify and block new variants and unknown threats, without the need to download a patch. Archive scanning—Detects and blocks viruses hidden within archived files. Cross-platform protection—Blocks Windows malware so it’s not transmitted through the Linux environment. McAfee VirusScan Enterprise for Linux software integrates with McAfee ePO software, the industry’s leading scalable, web-based tool for managing and enforcing anti-malware protection and policies. McAfee ePO software provides comprehensive policy management, detailed graphical reporting, and software deployment for the Linux, Windows, and Mac clients on your network for improved security visibility across your entire infrastructure. Your server infrastructure is critical to your business, so it is imperative to protect these servers from malicious threats like viruses, spyware, Trojans and others. McAfee VirusScan Enterprise for Linux software offers real-time protection, low processing overhead, and support for most common Linux distributions. McAfee VirusScan Enterprise for Linux software also provides a kernel-scanning cache to ensure that processing power is not wasted. Always-on, on-access scanning—McAfee VirusScan Enterprise for Linux software provides continuous, on-access anti-malware protection for Linux against malware and other threats. Archive scanning—While other anti-malware products are fooled by viruses hidden within archived files, the McAfee archive scanning function detects and blocks such threats, providing more complete anti-malware protection for Linux. Automatic updating—By automating the update process, McAfee frees up IT resources and ensures that the most current updates are always in place. Updates are done behind the scenes and do not require a system reboot. Cross-platform protection—McAfee VirusScan Enterprise for Linux software is designed to meet real-world needs, including heterogeneous system environments. The superior anti-malware protection of McAfee VirusScan Enterprise for Linux software is effective against various types of Windows malware that try to pass through to a Linux system. Enterprise management and reporting—The software can be centrally managed from a single console with the McAfee ePO platform—one of the only truly scalable security management and reporting platforms available today—enabling you to manage your entire endpoint security. Runtime kernel module—Automatically supports the latest distribution, saving both time and effort. On-access scanning without kernel modules for kernels 2.6.38 with fanotify ensures Linux is always protected even after kernel updates. 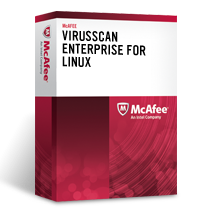 Download the McAfee Virusscan Enterprise for Linux Datasheet (PDF).